First Watch is a buddy cop movie in a high fantasy setting, where our two comically mismatched partners (a wet-behind-the-ears human and a grizzled veteran dwarf) have to find a way to get along and solve an increasingly complicated mystery in an early-modern city riven by factionalism and peopled by elves, orcs, mages, humans and dwarves. The premise would have sold me on this book immediately… if it was 1988 and Guards! Guards! By Sir Terry Pratchett didn’t exist. Unfortunately for Dale Lucas, Pratchett’s City Watch books do exist, and even the weaker entries in the series are significantly better than the pretty generic version we get in First Watch. We get a lot of world-building and info-dumping interrupting the story. The first half of the book particularly has a terrible as-we-all-know flavour to the narration, which makes our protagonist’s voice stilted and unbelievable. The orcs and dwarves are so far the standard fantasy version, and the obligatory different take on elves isn’t that new or interesting. We also get an extremely brief overview of the book’s fantasy versions of different human cultures. The author leans pretty heavily into the fantasy racism, to the point of getting uncomfortable. The city is supposed to a bustling melting pot, but ends up coming off pretty flatly. There are some positives to this series – Rem and Torval, our protagonists, have more to them than meets the eye and even in this first instalment are complex characters. 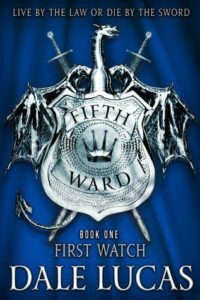 The books also set up an interesting rivalry between the watches of each of the different wards in the city, which will almost certainly come into play more in future books in the series. Once the book has some momentum it becomes a lot more engaging, and the mystery is satisfyingly complicated and comes together well. I suspect the author intends this to a long-running series, and it’s possible that this is just a rough first entry. But in the mean time, just go read Men At Arms. Share the post "fabricati diem, pvnc"
IMO, it’s methadone, so it won’t get you quite the same high, but it’s not a bad way to spend a couple of hours. Haven’t read it and am not going to, but mad props for the title of your review.